Corepoint and InterSystems lead a high-performing market, where integration engine configuration needs vary widely. While most vendors meet the broad requirements, Corepoint and Cerner (Siemens) are favored by users who are reliant on drag-and-drop functionality (i.e., wizards). Infor, InterSystems, and Orion are preferred by organizations needing a broader suite of development tools. In this study, integration engine vendor performance is measured beyond basic functionality to include automation-tool strength, scalability breadth, and factors such as customer support that drive client satisfaction. Corepoint outperforms all 2014 Best in KLAS winners. In this high-performing integration engine market, Corepoint leads the pack with an outstanding product and exceptionally responsive hands-on service and support. They also have the highest score for wizard-based development due to intuitive, simple tools. Several customers say Corepoint is the best vendor in their organization and embodies a true culture of service. Typically found in the largest healthcare organizations, InterSystems’ enterprise service bus is unique in its ability to either deliver a completed tool set or provide a development platform for organizations looking to design and implement their own complex interoperability solutions. Infor and Orion—who, like InterSystems, also enable HIE—offer solid tools, but customers report less continuous product suite development. 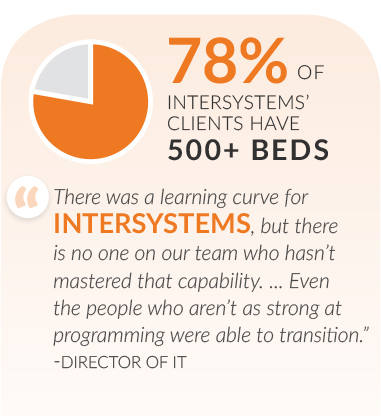 InterSystems scores much higher by delivering flexible, consistent programming functionality and quality support from a pool of technical experts willing to help clients build. Cerner OPENLink (Siemens) has seen a steady and significant rise in performance ratings over the past two years, scoring highest among largest clientele. Although they have contracted with few new clients recently and are found primarily in Cerner/Siemens environments, Cerner’s focus on continuous development enables them to deliver a scalable vendor-neutral solution. In contrast, Orion Health Rhapsody, offered in both SaaS and traditional on-site deployment, is the only major vendor in this study to drop in performance over the last year. While Orion continues to be a stalwart performer, numerous clients are frustrated with various functionality issues and lack of frontline technical support. The following vendors have a smaller market footprint but are still being considered by providers: 1. NEXTGEN MirthConnect is an open-source solution available both with and without vendor support. Supported customers score the product and vendor experience far higher than unsupported ones. 2. SUMMIT Express Connect is primarily found in community hospitals and is mostly used by MEDITECH customers. 3. QVERA is primarily seen as a component of GE Centricity ambulatory environments and is now also starting to sell directly into the acute care space. 4. INTERFACEWARE IGUANA is mainly found as a component of other vendor solutions, such as Fuji and TeleTracking. Clients are typically smaller to midsize hospitals, but some larger facilities are starting to embrace it.